Advertisement in email clients has always been a controversial topic. Microsoft pushed an update to the default Mail application on Windows 10 for Insiders recently that brought ads to the client; a feature that the company claimed later was never "intended to be tested broadly". The Mail application of Windows 10, and Windows 8 as well, is a basic program to manage email accounts on the desktop. It is not really suitable for users who use email a lot, but works fine if mail is used occasionally only. Other email clients for the desktop, be it the open source program Thunderbird or Microsoft's own Outlook application, provide far better functionality. Twitter user mehedi noticed yesterday that Microsoft started to display advertisement in the default Mail client for Windows 10. It turned out that some users were seeing these ads for a period of weeks or even months. A support page, which Microsoft pulled in the meantime, stated that the company was running an advertisement experiment in the countries Brazil, Canada, Australia, and India. Bleeping Computer ran a story in July 2018 about inline advertisement in the Mail client. Mayank Parmar noted back then that it appeared that Microsoft was running an A/B test as he could not replicate it back then on test systems (not counting the obligatory "Get premium Outlook features" ad that Microsoft displays in the Mail application. Microsoft's Frank X. Shaw, Microsoft Corporate vice president, communications, replied to the tweet stating that the feature was experimental and that it is being turned off. Microsoft introduced advertisement early on in the lifecycle of the operating system. Windows 10's Start Menu displayed ads -- suggestions as Microsoft called them -- from the very get-go, and that expanded to the Lockscreen, Share feature, and File Explorer over the years. While it is possible to disable Windows 10 ads, some users wondered whether it was right to display advertisement in an operating system that was not free. Advertisement is typically only displayed in free products and not in paid ones. Gmail users get advertisement but use of the software is free; this is not true for Windows 10, however, as it is not available as a free product. The placement of advertisement is controversial enough but the placement of ads in commercial products is even more controversial than that. Customers paid for Windows 10 and it seems likely that most are displeased when advertisement is displayed. 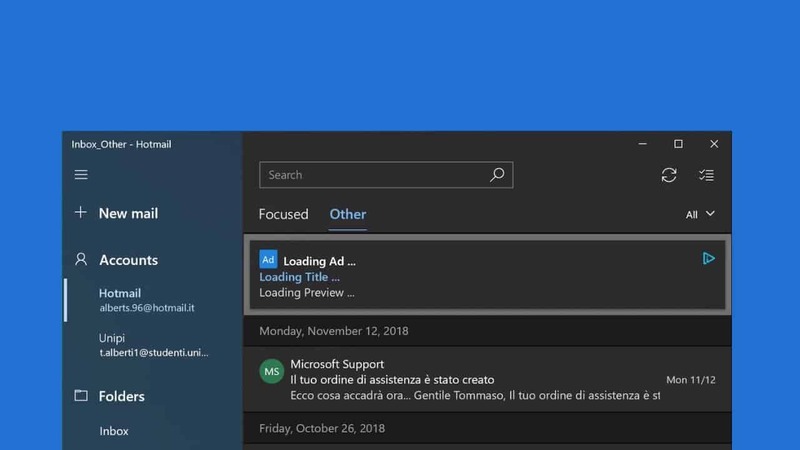 Microsoft pushed an update to the default Mail application on Windows 10 for Insiders recently that brought ads to the client. “Experimental only”. Sure Micro$oft. Suuuuure. Never use the windows default programs when there are alternatives. We’re lucky we have Thunderbird. Currently Mozilla does not seem determined to destroy it with ads and affiliate services like Firefox (with the possible exception of Filelink, those suggested services to send large file attachments, I don’t know if they’re still in). Mayank Parmar said this experimental feature is being turned off but it doesn’t mean they won’t come with a similar feature or enable this one later. Why experimenting with ads in the first place? They want to make Microsoft products cloud subscription-based. Remotely managed, etc. With Microsoft having full access to your LAN via Windows. The ads will be in home/budget versions of Windows most likely. Windows Mail client is a pain which users feel when they need to reinstall the OS. Databases are not backwards compatible, there is NO BACKUP option and you can only export one email message at the time. Total crapware app. Do not use. So not only I have to pay for this beta-quality OS, and they show ads. WTF? Ads on mail app is on their agenda, that’s their disgusting long term plan. I read yesterday that they are going to be in the calendar app too. I can only imagine how nasty and annoying it will be when they eventually start peppering the UI of the OS with advertisements, on top of the ads that are already on the web or that you get in your email as junk mail. Microsoft will find a way to make this work, just like they did with lock screen ads in Windows, as though you are using a subsidized $30 tablet. race to the bottom. swirling around the toilet bowl. india-soft and india-tel used to be wintel. If you can disable ads in W10, it’s a useable product then. If not, you’re just running one giant ad infested software. As shipped, Win 10 looks like a poorly constructed web site full of cartoons, nag features and spyware. A company like Microsoft is not going to spend time and money on something they’re not actually considering doing. They’re only back pedaling because of the outrage. Windows 10 already has ads and spying in the OS, it’s only going to get worse. Luckily, there are other options. Linux Mint is pretty easy for most Windows users. Linux is free software and free of ads. Screw the greedy corps and use open source honest programs. My feeling with Windows 10 and advertisements has always been that if I can permanently turn the advertisements off, I will, and I can live with that if they stay off, but if they ever build in advertisements that I *can’t* turn off, that’s when I try testing Linux on my hardware to see if it’s supported, and gear up for a switch if possible. Ditto if they start charging a mandatory monthly or yearly subscription fee, hiding the file system (That one’s really unlikely, but it seemed to be where Apple was headed for a while, and the libraries feature on Windows seems like it *could* be a step in that direction, so one never knows), forcing me to the cloud (maybe that would be why they’d be hiding the file system), refusing to let me run programs from my own hard drive, or something equally annoying. The truth is, though, that I’ve always been able to turn Windows ads off, and it’s been a long time since I’ve seen any of them, because when I turn them off, they stay off. I use Thunderbird as my email client anyway, so I am not even sure ads in an app I never use like Windows Mail would cross my “red line” where I start looking to abandon ship even had Microsoft not backed down. I never open the app, so I’d never have seen the ads. In my personal experience, Linux has been a very frustrating operating system for me. I had a lot of trouble getting done what I want to do, finding good driver support that didn’t break on every upgrade, etc.. Windows has tended to “just work” for me from Vista on forward (I know most people hated Vista, but I was an exception- I felt it was much better than XP in terms of security and personal usability), and when I want to adjust things, almost everything is solvable through the graphical user interface, whereas I experienced more problems with Linux and had to drop to a command line I was not familiar with constantly because the GUI either didn’t have the options needed, or did not present them in an intuitive enough way for me to discover them just messing around the way I can with Windows. However, it’s always good to have a break glass fallback position, and mine is that if Windows gets too bad, I’d look to Linux. I’m glad it’s out there in case I “need” it, and sometimes I run a distro or two in a VM to try to stay relatively current on what it’s like. I think if I were to switch to it as my main PC OS, though, I’d probably go for the TLS versions and stick with them until support comes close to running out, and try to look into buying a laptop with Linux preinstalled to navigate around driver issues. However, Linux laptops are often more expensive than comparable Windows PCs and it’s harder to find deals or things like bad or no credit financing offers and whatever. I even found, and, granted, this was 10 years ago, that Linux distros seemed to just not support some of the hardware that was common to some of the cheaper Windows PCs- it was like the enthusiasts all had the money to buy nice PCs, and so the attention went towards having good drivers for the good hardware rather than the lower end hardware (This may have changed). So, I’m sticking with Windows for now. In truth, I read probably an article somewhere on average once a week that says Windows mandatory ads are coming or that Windows will charge a monthly service fee. I’ve been reading those for years. Maybe eventually they will prove to be right, but I am not so sure. They’ve been wrong to this point. And Windows still has to fend off MacBooks on the high-end, Chromebooks on the low-end, and potentially a surge in Linux users on the techy end if they do something to really offend enough of their user base. They have a lot of reasons not to really force ads on people or to charge money. I do kind of miss the Windows 10 rotating lock screens. Those were some really cool pictures. One day it had a link to click to “shop till you drop”, though, so I had to replace it with a static photo of my own. So, I kind of lost a feature there along with the odd. I started having the built in wallpaper switcher switch my wallpaper automatically from a large collection of wallpapers I have on my own harddrive, whereas I had just been using a static image, though, so it works okay. I wouldn’t have minded a Windows watermark on the lock screen, and in fact some wallpapers I rotate have a Bing watermark, but the link to shopping was too much, and I disabled it. But it’s not like disabling it left me with a blank log-in screen or something. I have a nice picture there that I selected.